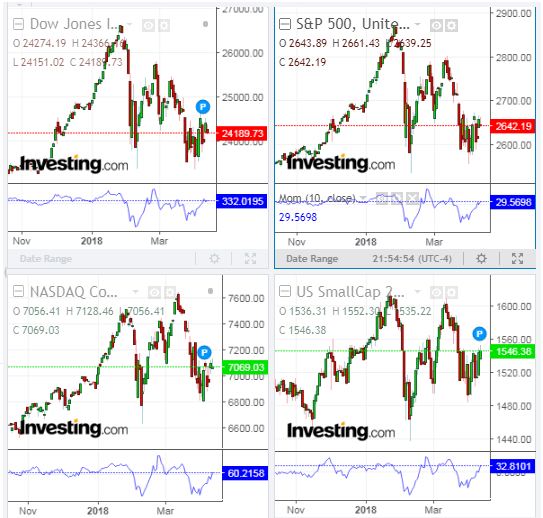 The Russell 2000 Index (RUT) is holding closer to its January all-time highs, compared with the Dow 30, S&P 500 and Nasdaq 100 Indices, as shown on the following daily charts. Its momentum indicator remains the strongest, of late, and is above the zero level, as are the others. As well, the RUT is showing relative strength in terms of the percentages gained/lost on the following year-to-date and 1-week graphs. All of this suggests that traders/investors preferred to accumulate risk to value lately. Keep a close watch on the RUT for leadership on any further strength, or lack thereof, as a potential indicator of whether equities, in general, will either rally towards new highs or drop to new lows for the year, in the near term.